Making complex mine schedule optimization easier. Trucking. Waste dumps. Mineral processing. Capex. Everything. And just as importantly, it makes it easy for you. Create audit reports for non-planners to confirm workability. Create optimal practical LOM mine plans that meet all your project constraints. Jointly optimize cut-off and cut-over grades with the mine schedule, providing even more business value. Determine the type and capacity of your process plants. Determine the type and size of your trucks while respecting their limited life span. Enjoy the flexibility to provide the right information to the right people. 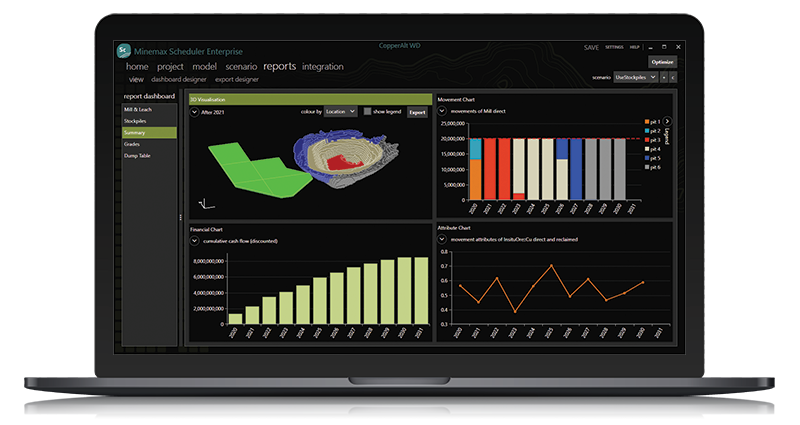 Integrate your mine schedule and waste dumping in one optimization. Add even more value with automated stockpiling and reclaiming. Constrain attributes and material types to optimize recovery. Save time by optimizing multiple scenarios at once. Simultaneously optimize mine schedules with multiple capex decisions. Faster solve times to act on results quicker. Evaluate more scenarios to make better project decisions. Accurately model time-delayed leach recoveries and avoid tedious manual post-processing. Contact us for other purchasing options including network licencing, short-term rentals, and perpetual licenses. How long will it take me to get up to speed on Minemax Scheduler? I have very limited time to update our strategic schedules every quarter. It depends how complex your operations are, but once your model has been set up it doesn’t take a lot of time to run several scenarios, compare them, and create new schedules on a regular basis. We offer basic to advanced software training options to help you get up to speed and get the most out of Minemax Scheduler. 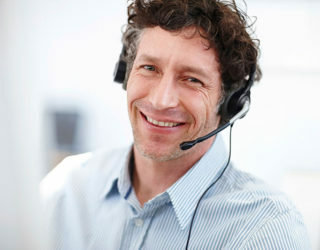 And our support team is just a call or click away if you need help. Will Minemax Scheduler optimize haulage? Yes, as an integrated mine planning and scheduling tool, Minemax Scheduler optimizes all aspects of strategic mine scheduling, including trucking requirements. With one optimization interaction, you can determine the optimal truck fleet size, as well as the ramp-up schedule. Is this a block-by-block scheduler? I don’t need that level of detail. Minemax Scheduler has the capability to optimize a schedule block by block; however, the size of many mining problems makes this prohibitive for most computer hardware. To achieve a detailed strategic schedule with an appropriate level of detail, we generally employ an attribute-based re-binning strategy. That way, like materials on benches are combined, while unlike materials are kept separate. This maintains the selectivity of the material for mining processes and downstream destination decisions, and also allows for a speedy result on most machines. How easy is it to pass this data down to the teams at site? It’s really easy to extract your mine schedule data from Minemax Scheduler and use them for post-processing in your design package, using customizable reports and export options. Data can be exported in numerical format (csv/excel) or spatial format (dxf) and imported into most mine design software packages. You can also export a dxf of the blocks remaining at the end of each mining period, so you can review the face position visualization in your design package as your mining schedule progresses through time. You can also share your schedules using our free Minemax Scheduler Viewer software. How does optimization in Minemax Scheduler compare to other strategic mining software out there? Minemax Scheduler is an automated mine scheduling tool which leverages multi-period optimization to determine the maximum NPV solution for you. It’s an integrated tool which jointly optimizes your block destinations, cut-off grades, blending, equipment expenditures, waste dump sequencing and much more. The fundamental difference is that Minemax Scheduler delivers a mathematical guarantee that the best solution found meets all constraints and is the real optimum. Other mine planning software out there typically employs heuristic methods which cannot deliver on these items. Minemax Scheduler delivers practical, economically optimal schedules by virtue of its advanced solving mechanism (schedule optimization using best-in-class CPLEX technology) as well as its versatility in application (existing operations, new projects, multiple commodities, etc.). Minemax Scheduler has been invaluable in providing optimized strategic planning solutions in a timely manner. The newly added dumping modelling module allows easy incorporation of basic waste dumping scenarios into the NPV analysis and quickly replicated a hand generated schedule. We saw that Minemax’s scheduling results satisfied all our scheduling constraints. Choosing your mine schedule optimization software is a big decision. Contact us for advice on which Minemax Scheduler edition is right for you. Every mine is different, so why not ask us to help you set up and configure Minemax Scheduler to suit your unique mine planning, scheduling and optimization requirements? Would you like to see what our mine planning and scheduling software can do? Please get in touch to arrange a free demonstration.